Scoring legend H. van Smeiter totally owned that #17 shirt for Holland. Fact. I have honestly never seen someone more proficient up front in an orange shirt. I have seen goals fly in from the halfway line seconds after kick off leaving the Qatari goalkeeper stranded and looking rather bewildered as to why his team were a goal down already. But van Smeiter could do anything, pass, dribble and most definitely shoot. Yes, he was the total package and no one else in the world was anywhere near his ability. No I’m not on glue, I am of course talking about the enigmatic and talismanic striker from FIFA International Soccer on the Mega Drive. This guy was the best striker in the game and even led the line for the EA All Stars. I think he had something like an overall of 92, which in FIFA terms means you’re pretty amazing. 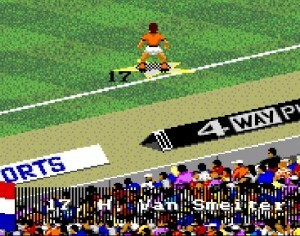 This of course was in the halcyon days before EA Sports started sucking up to that rotund oaf Wayne Rooney. It was great, albeit being only in 16-bit graphics, to have menus and intros not having a well scrubbed potato paraded in front of us like some kind of pig carnival. Anyways, van Smeiter is better than Rooney in all aspects on the pitch. But he’s also an enigma..what does the “H” stand for? Henk? Henrik? Hedwiges? Who knows! It’ll remain a great mystery for years to come, a bit like what does the “M” in M.Bison stand for? Either way, the leading light in both the dutch national side and the EA All Stars was van Smeiter, arguably one of the greatest strikers of a generation. Strange : In the EA All Stars team was besides Janco Tianno of Brazil another Janco Tianno. Who was he ? Where did he played besides the EA All Stars ? Was he just a clone of the brasilian Tianno ? His twinbrother ? Seems to me a bigger mystery than where the H from van H van Smeiter stands for. Germany was my favorite team en Brian Plank the all time striker legend. 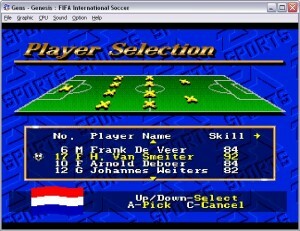 The goalkeeper of Denmark was the player with the highest skills : 96 Tianno had 94, Perron had 94, van Smeiter 92. Brian Plank had 90 but he was still the very best. He is a striker you will never forget. I hope that EA will release in the nearby future a new soccergame where the players have fictionel names. In 20 years no one will remember Rooney or Messi but strikers like Plank, Tianno and van Smeiter will remembered for ever and ever ! 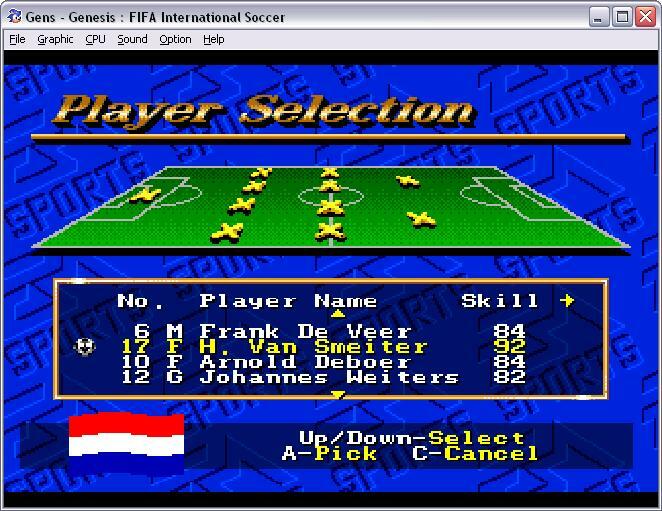 Janco Tianno was Jan Tian, the lead programmer on the original FIFA, he left the FIFA team in 1996 probably because he’d done such a good job. I was 7 years old when I started playing FIFA International and I absolutely loved this dutch wonderman. So much that I even insisted on naming our cat “van Smeiter”.